Compact, low energy, effective waste water treatment. 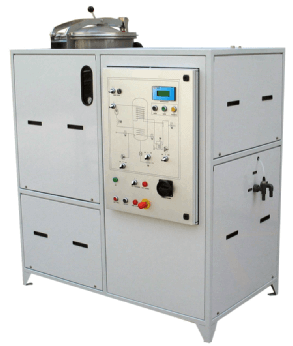 Ideal for aqueous washers or oil emulsions and machine tool coolants. The AquaCube system is totally automatic and provides a simple and economical answer to the treatment of wastewater from parts cleaning equipment and coolants from metalworking operations. The system works 24/7 and can treat over 300 litres per day. The system concentrates the water containing oil up to 15 times, allowing the water to be reused and reducing the waste to a minimum. This means great savings for you whilst helping the environment. Thanks to its special design the unit is very quiet in operation. Using low energy heat pump technology and a vacuum, the water is evaporated at a low temperature of only 35° C producing clear clean water for reuse. 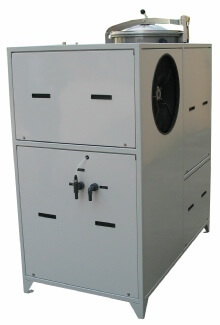 The compact units are easy to install to new or existing plant. Can be retro-fitted to existing equipment. Only requires small floor space. Removes oils and other contaminants from wash and rinse solutions. 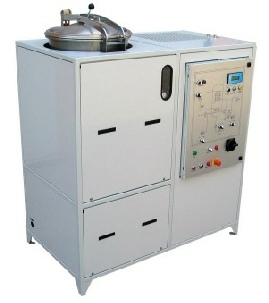 Ideal for connecting direct to degreasing equipment for continuous bath cleaning. Generates cost savings through reduced water consumption and removal of waste off site. No emissions to atmosphere and can be used to form part of ISO14000. Automatic loading and unloading operation. Fully certified to EC Norms.